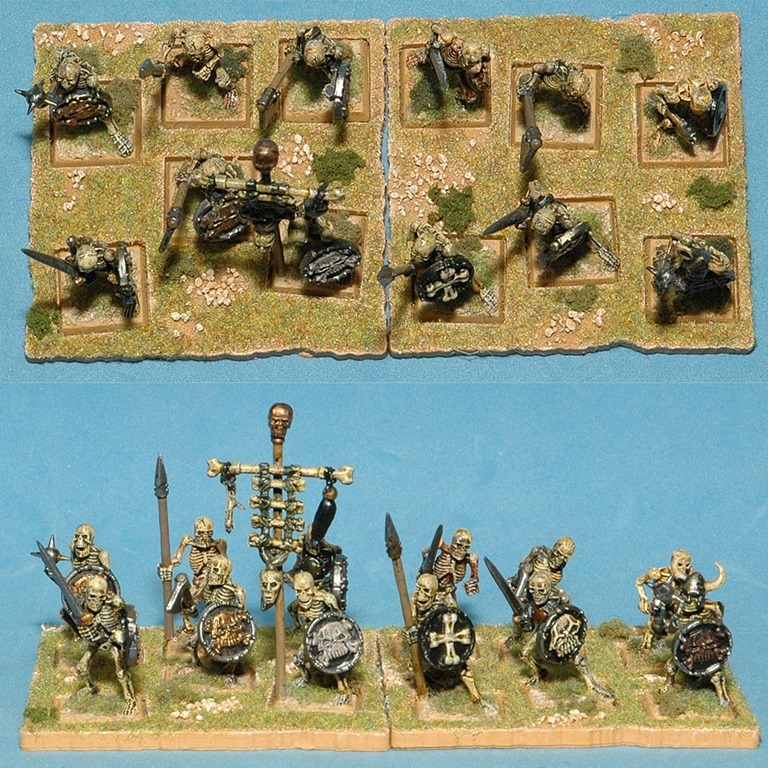 I’ve been collecting undead models on and off for about 30 years now, but I’ve never yet managed to complete a force big enough to fight a decent game of Warhammer Fantasy Battle or similar. But now Dragon Rampant has arrived and I’ve been motivated to get a force assembled. I went off to my cupboards to look for skeletons and here they are. The bulk of this force is made up of plastic skeletons I’ve had for decades. Some of them date from when I worked for Games Workshop (pre-1990) and another load come from a Tomb King Army I bought when it was released in 2002. All the metal from that army has gone to Ebay but there was a ton of plastic left including infantry, cavalry and chariots. They’d have been sold too if I thought it was worthwhile. I’m glad I hung on to them. I’ve spent a couple of months, on and off, touching up models, inking some skeletons to make get them the same shade as others, and doing some rebasing so that that the whole force looks coherent. I’ve bought a few new figures and painted some from the plastic mountain. You’d think 100 points for Dragon Rampant would be enough, but I still want to add a few extra bits and bobs so that I have more flexibility in choosing a force. 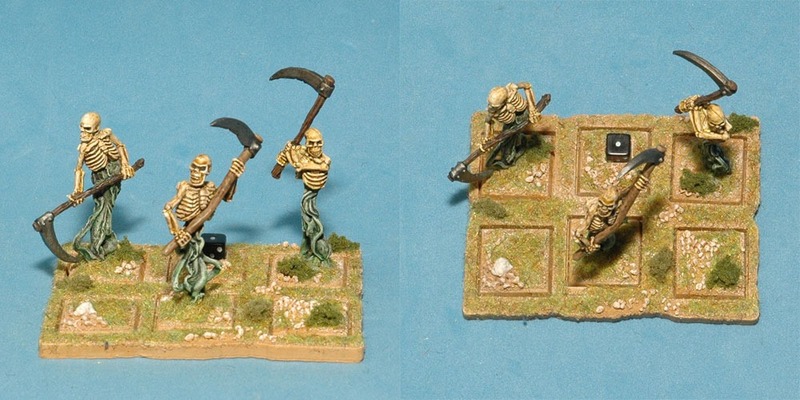 I’ve been helping Mike Scott of Supreme Littleness Designs put together a range of sabots for people wanting to use their old Warhammer armies for Dragon Rampant. The basic principle is that the common types of unit, 12 man infantry and 6 man cavalry, are represented by 2 sabots, cut to accept figures on standard GW bases. Casualties are indicated by removing figures and one of the stands comes off when the unit gets down to half strength. Six man infantry units go on a single sabot, again with figure removal for casulaties, while Reduced Model Units go on sabots with slots for figures and frames for 7mm dice which are used to record casualties. 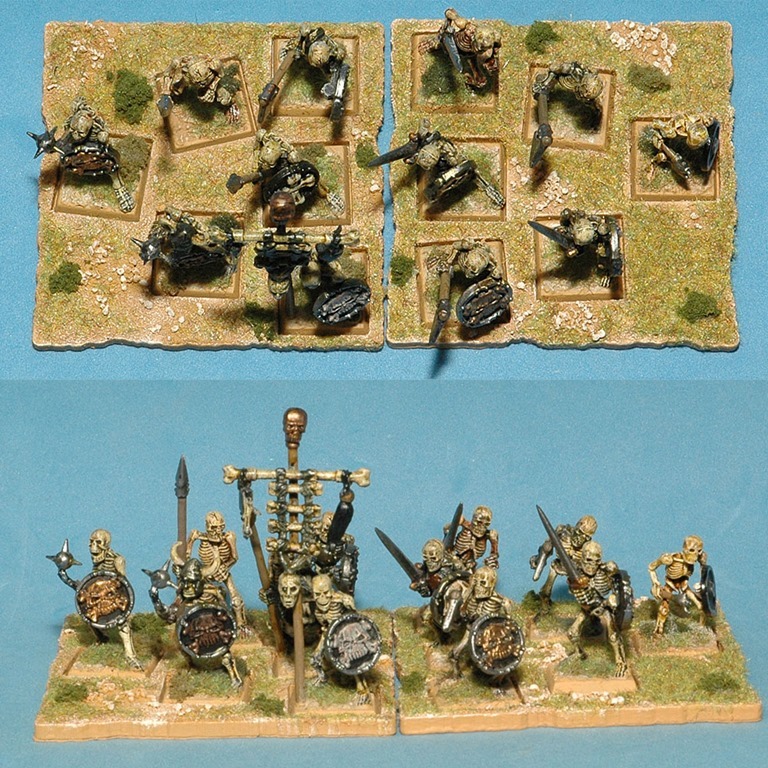 For the bulk of my infantry I am using old Games Workshop plastic skeletons, though I also have two units of metal ones. I collected these over many years and the figures are come from several different generations of these highly useful models. Some of them are from the Tomb Kings range. Seven units of twelve should be enough given that they can represent different troop types when put on different sabots. On close order sabots they are Heavy Foot. Use of a two triangle formation sabots creates a blob like formation, suitable for Bellicose Foot. 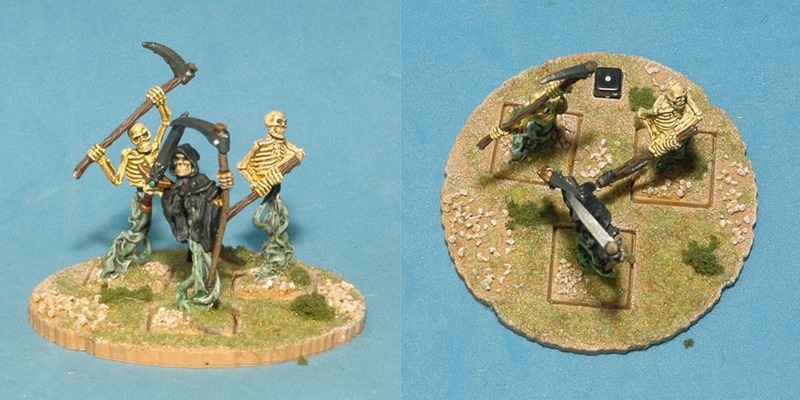 Light Missiles – skeleton archers on close order sabots. The same models mounted on open order sabots can be used as Scouts. I don’t think I’ll be using this option much, the way scouts function in Dragon Rampant doesn’t fit in with my image of an undead horde. Currently I am using these Spectres from Black Tree Design as my Elite Foot. I’m not 100% sure I like this though and they might wind up being Bellicose Foot instead. 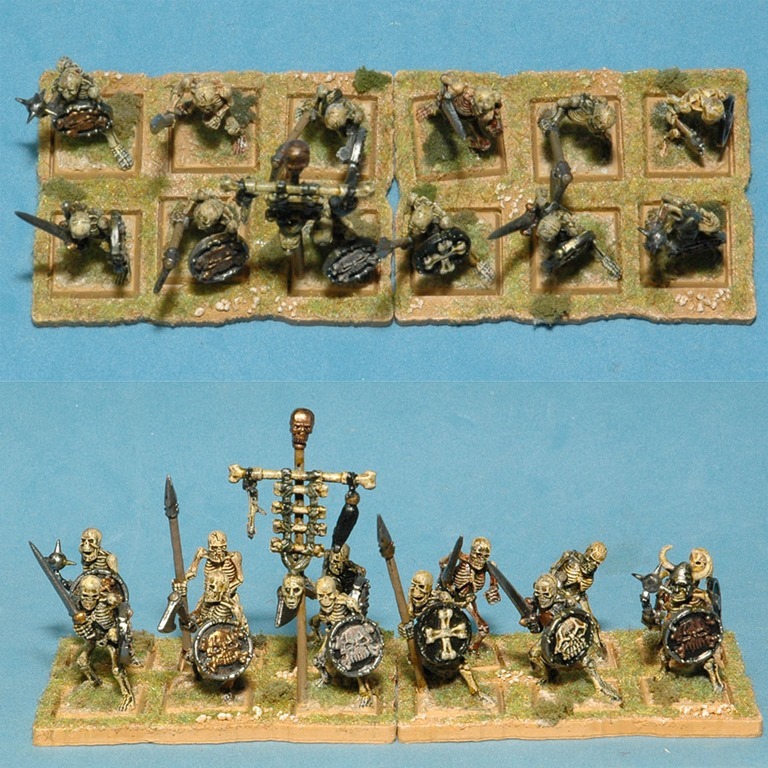 I only have two units of Spectres, but if I want more Elite Foot I’ll field them as four Reduced Model Units. Here I’ve used close order sabots along with inserts I’ve made using slottabases and dice frames. The dice is used to record hits on the unit. Cavalry are also plastics from Games Workshop, shame they are no longer available. I haven’t found any affordable figures that I want use for Elite Riders yet, though I’m still looking. And I don’t see any role for skirmishing Light Riders, they’re just too subtle for my vision of an undead horde. 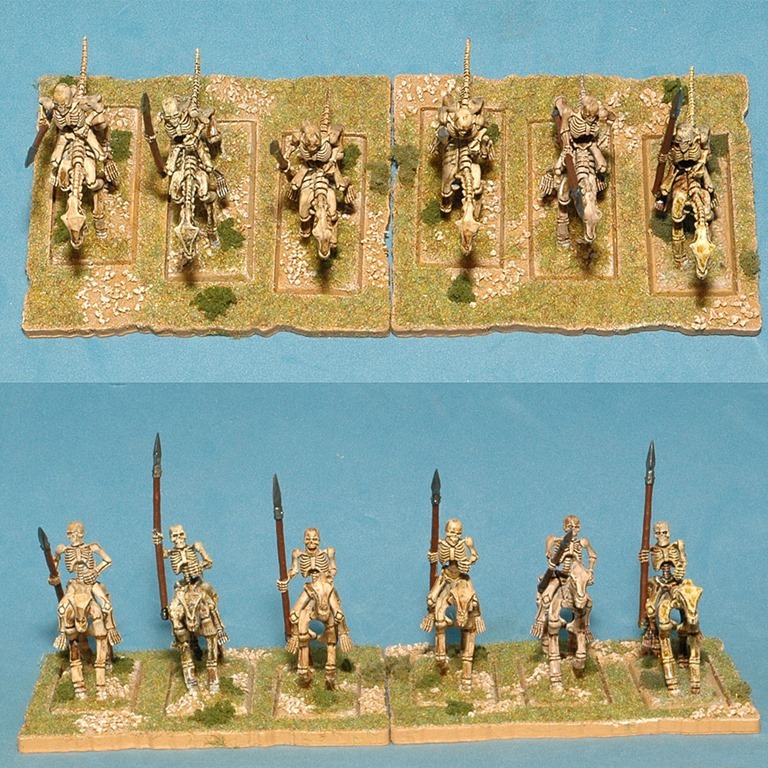 Chariots from Games Workshop’s discontinued Tomb Kings range. 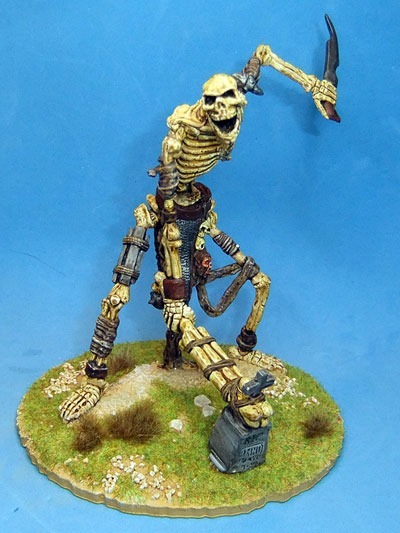 Greater Warbeast – A Colossal Skeleton from Reaper Bones. When I saw this model I just had to have it as a centrepiece for my force. Five inches tall and just under £17 (inc p&p) from SnM Stuff. 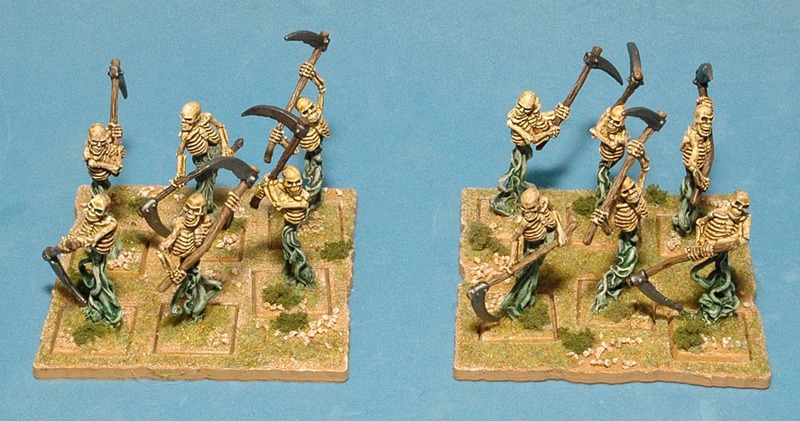 Lesser Warbeasts – For now I’m going to use these Reaper Bones Barrow Wardens as Lesser Warbeasts. I need to get another one so I can have two units of two. At the moment I’m using this Spectre from Black Tree Designs as my Leader, but more are on their way. He goes into battle accompanied by two Spectre henchmen, one of whom gets removed when the unit is at half strength. I’ve got a Wight King from Games Workshop on the painting table, he’ll provide me with another leader. More Leaders and single model units are planned. A mentioned above I’m looking for some affordable Elite Riders. I rather like Games Workshop’s Blood Knights, but at £12 each that’s not going to happen. Mantic’s Revenant Cavalry might do the job, but other suggestions are welcome. I quite fancy getting some Ravenous Hordes, Mantic’s Zombies are the obvious candidate here. I’ve been watching Game of Thrones. No skirmishing for the undead, just a mad rush at the living.